The photo at left was taken on the broad, sloping plateau above Fury Beach -- and yes, of course, it's part of a seal's skeleton, not a man's -- but when I stumbled upon it in the company of a group of fellow voyagers a couple of weeks ago, we laughingly gave it that name. 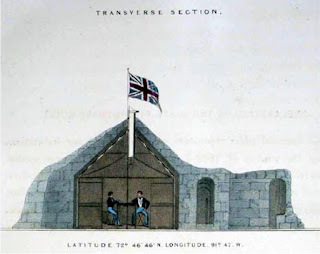 And well we might, as we'd already visited Beechey Island, Sir John Franklin's first winter camp of 1845-46, and paid our respects at the graves of the three crewmen who died there. The phrase was in our ears as well as on our minds: the night before we landed at Fury Beach, we'd all joined together in a rousing chorus of Stan Rogers' immortal "Northwest Passage": "Ah for just one time, I would take the northwest passage / to find the hand of Franklin reaching for the Beaufort Sea ..." As part of One Ocean's 'Pathways to Franklin' voyage, of course, we were all in a sense seeking Franklin, though also realizing how much time, and tide, and scouring ice had worn down the shores on which he and his men once trod. At Fury Beach, we found a wide scattering of barrel staves and hoops, the last remnants of what had been a substantial cache of supplies offloaded from the wreck of Parry's HMS Fury, which had met its fate there in 1825, too badly damaged by the ice to be repaired. On that occasion, Parry had ordered his men -- including a young midshipman by the name of Francis Crozier -- to offload the supplies and cache them on the beach, should any future Arctic explorer have need of them. Clark Ross had abandoned their ship, the Victory, in Victoria Harbor and trudged up the coast of the Boothia Peninsula and Somerset Island, in hope of rescue. For the winter of 1832-33, they found shelter at Fury Beach, living comfortably off the stores and erecting a modest dwelling of canvas tenting and snow-blocks they dubbed "Somerset House" during which they enjoyed a winter of relative comfort. That next spring, they sailed their small boats up into Lancaster Sound, where they were rescued by a passing whaler -- indeed, the very same ship that had once been Sir John Ross's during his 1819 exploration of Baffin Bay. Grand as that structure appeared in this lithograph of its "Transverse Section" in Ross's book, its mostly ephemeral building materials have left no trace detectable today. One of the peculiarities of the Franklin mystery is why Crozier -- who became its commander on the death of Sir John in 1847 -- never sought out Fury Beach for the same reason. He may have thought its stores depleted, but those who revisited the site in the 1850's found that there was still a considerable amount of some stores, such as flour, that was perfectly usable. After all, having placed the original cache, and having Ross's account of his expedition in his shipboard library, he could have readily learned what remained. Ross, though noting that his men had eaten all of tinned meat, gave a tally of "“30 casks of flour, each weighing 504 lbs, and 12 casks of 336 lbs; 11 casks of sugar, each weighing 372 lbs; a few kegs of lime juice, and a large quantity of parsnips, carrots, soups etc." All that's left now, aside from the timbers of the Fury which one can dimly glimpse through the icy water, is a few old bits of wood and metal that can, at most, merely hint at the human presence here at this remote strand.